I normally try to keep things apolitical on Lady Light Travel. I hope however, that you will take some time to consider an issue that affects most LLT readers – misogyny/discrimination/violence against women. It is here every day. It’s so rampant that we don’t see it any more. It’s normal. It affects every woman traveler. We don’t go out at night. We travel in groups. We carefully choose lodging with safety as a factor. While men may consider these things, women make them a priority. We have to. If you are like me, you have good friends and even family that have been raped or physically assaulted merely because they were women. I normally get my news from several sources. I know that each outlet has its own biases and will feature stories based on that bias. I created a screen shot from Fox News on May 29, 2014. The only reason I picked Fox is that the headlines are clear and readable. 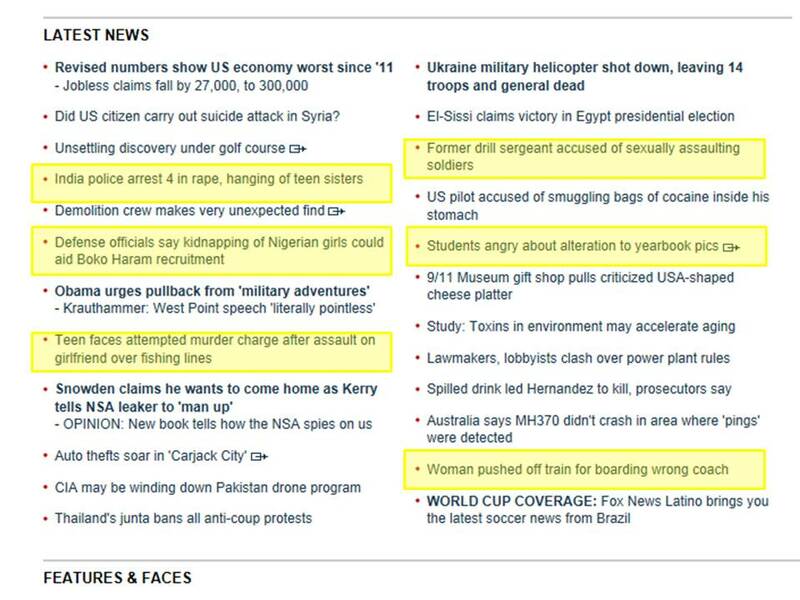 I highlighted headlines where violence/discrimination against women are the main part of the story. A full 25% of the 24 news stories are about some form of misogyny. This is on a normal news day. If you are given the opportunity, please discuss these issues respectfully with the men in your life. While many of them are aware of the problem, they are not aware of the sheer pervasiveness of the incidents that occur. They aren’t aware that this happens every.single.day. They aren’t aware of the magnitude of the issues. These are not one-off incidents. That’s what changes it from a mere annoyance to an important social issue. This pattern of misogyny needs to change. It affects all of us. I love your site – and this is an issue close to my heart. I’ve spent much of my life on legislation and policy to improve the lives of women – but we still, as women, live in a world where women are neither respected nor treated well. It seems every few weeks (in Australia) some man kills a woman – and often their children as well. It’s often treated as a “mental health” issue – but the role of misogyny and the flawed thinking that sees women as possessions rather than as people in their own right continues.